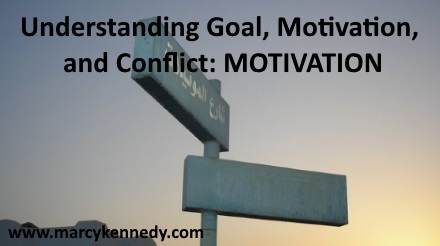 As part of my mini-series on goal, motivation, and conflict, we’ve already talked about the antagonist’s role in building conflict in our story. 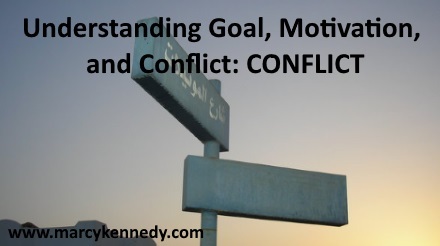 This week I want to look at good conflict vs. bad conflict. Alongside the antagonist standing in our character’s way, our character is also going to face other challenges in reaching their goal. It could be other people, it could be physical obstacles, it could be puzzles they need to solve or clues they need to gather. We call these challenges conflict. Here’s the tricky part for many writers. 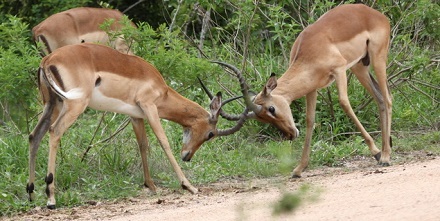 As Dwight Swain said in Techniques of the Selling Writer, “conflict for conflict’s sake” is useless. It hurts our story rather than helping it. To put this another way, not all conflict is created equal. The best way that I know to help writers understand good conflict that turns their story into a page-turner is to explain bad conflict that annoys the reader and makes the story feel pointless and slow. So here are the top three offenders when it comes to bad conflict. There’s a difference between characters disagreeing over how to handle a real problem that they need to solve and characters that seem to be arguing simply for the sake of arguing. If our characters bicker over minor differences, this is bad conflict. (I’d argue it isn’t even really conflict.) If you want an argument to have any chance of working as conflict, it needs to stem from deep, fundamental differences in your characters’ belief systems, morals, or end goals. Petty squabbling isn’t interesting, and it can make our characters seem childish and stupid. Another expression of this type of bad conflict is a character that argues or disagrees even when doing so isn’t in their self-interest. A character shouldn’t randomly pick a fight if doing so hampers reaching a much more important goal. Our characters should get along at least some of the time. When you’re thinking about adding an argument for conflict, consider where what they’re fighting about sits on each character’s personal value scale. Is achieving the goal more important to them than the particular thing they’re fighting about? If so, delete that argument. If the content of what they’re arguing about is more important than the end goal, then the argument works as conflict (e.g., a character whose moral compass says I won’t kill for any reason vs. a character who believes killing in pursuit of their goal is a time where the end justifies the means). If our characters could sit down and resolve their misunderstanding with an adult conversation, we don’t have conflict. What we will have is annoyed readers. Misunderstandings only work if there’s a strong reason these two characters can’t talk it out. By strong reason, I mean something like one of them is a POW and can’t communicate with the outside world. Rabbit trails are conflicts that are unrelated to the goal. These conflicts might be fascinating in a different story where they actually matter to the long-term goal, but when they only serve as a detour, they actually slow the story down and cause readers to lose interest. Here’s an example. Let’s say we have a pair of archeologists who think they’ve located the hiding place of the Holy Grail. Good Conflict: One of our archeologists is kidnapped by a drug cartel that plans to torture him for information because they also want to find the Holy Grail and sell it to the highest bidder. Bad Conflict: One of our archeologists is kidnapped by a drug cartel that is kidnapping random people will the plan to force them into becoming drug mules to smuggle their product across the border. Do you see the difference? One roadblock is random and unconnected to the larger goal. This type of conflict will frustrate the reader because they’ll want to get back to the real story. The other roadblock increases tension and keeps the story moving because the conflict is intimately connected to the larger story goal. Do you have any questions about conflict? I’d love to answer them either in the comments or in another post. Interested in more ways to improve your writing? Check out my Busy Writer’s Guides such as Description, Deep Point of View, or Internal Dialogue. Over the past few weeks, we’ve been talking about goal, motivation, and conflict and how they work together to fuel your story. Today we’re moving on to the final of the three. Conflict comes down to who is standing in your character’s way and what your character will have to endure to achieve their goal. Today I’m going to talk about the who. Every story needs an antagonist, but not every story needs a villain. A villain is “bad.” An antagonist is just someone (or something) who’s standing in the way of your main character achieving their goal. This sounds obvious, but there are, surprisingly, a lot of ways where we can go wrong with this part. I’m going to give you the most important elements that you need to get right about the antagonist. Our antagonist needs to be stronger than our protagonist at the start of the story. If our antagonist isn’t stronger, then the story isn’t going to be very exciting. Our protagonist will succeed too easily. Our antagonist’s goal needs to be in direct conflict with our protagonist’s goal. Think about this like two people playing tug-of-war. There’s no way they can both win that match. Whoever pulls the other across the line first, wins. The other loses. We need the same win-lose scenario in our book. If we don’t have it, our conflict will be weak. For example, if we’re writing a mystery, the protagonist wants to catch the murderer and the murderer wants to escape. Only one of them can succeed. In Star Wars, Luke and Darth Vader were fighting over who would control the universe, the rebels or the empire. Only one of them can succeed. Our antagonist needs their own equally strong motivation. “Because he’s evil” is not a motivation. If we want to create an antagonist who’s more than a cardboard cutout, we need to understand why he’s fighting just as hard as our hero to achieve the goal. Our antagonist is trying to do what they think is best in the same way that our main character is trying to do what he or she thinks is best. Even if they’re a true villain, they usually won’t see themselves as the “bad guy” because they can rationalize their actions, the same way we can often rationalize away our wrong actions if we’re not careful. To your antagonist, it’s your main character who is the “bad guy,” the problem that’s standing in the way of achieving their goals, desires, and dreams. What about society, nature, or self as the antagonist? You can write a story like that. Castaway with Tom Hanks or Andy Weir’s The Martian both have nature or an environment as the antagonist. Those stories are much more difficult to write though. Understand you’ve created an additional challenge for yourself, and make sure that you amplify your conflict. The risk with stories where the antagonist is the self, society, or nature is that there won’t be enough strong, urgent conflict on the page or that the conflict won’t be clear enough to understand and follow. One thing that can often work is to choose a figurehead if your antagonist is self or society. Choose someone who will represent those antagonistic forces and give them a human face. Katniss in The Hunger Games was fighting against a decadent, oppressive society, but the human face of that was President Snow. I’ll go over these external forces more in the next post where I talk about what your character needs to endure to achieve their goal. Do you have other tips about antagonists or conflict that you’d like to share? 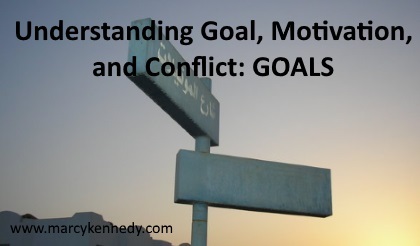 Last time we talked about goal in the triad of goal, motivation, and conflict. This week, we’re going to take the next step by talking about motivation. Motivation is one of the most powerful forces in fiction. Our readers will follow our characters through anything as long as they believe the motivation. Motivation is the why. Why does your character desperately want to achieve their goal? This ties tightly into why the goal is important. It’s what’s at stake. What do they stand to lose if they don’t achieve their goal? That’s going to be part of what motivates them to reach it. What’s easy to forget about motivation is that it comes on two levels—the external, conscious level and the internal, subconscious level. The best stories will have both and they’ll work together. The external, conscious level is the obvious why. The internal, subconscious level is the underlying need that your character probably isn’t even aware that they’re trying to fill. I’ll give you a really simplistic example just to make the difference clear. The character wants to get a raise at his job (his goal) so that he can buy a bigger house (his external motivation) because he believes that will earn him respect from his family (his subconscious need). That one’s pretty obvious, but the connection doesn’t have to be blatant as long as the dual motivations work together. An example that I really like is from the movie White House Down. The main character is ex-military, and he’s in the White House on a tour with his daughter when terrorists attack. The main character’s external goal is to save his daughter and the president from the terrorists who’ve taken over the White House. His external motivation is that if he doesn’t save his daughter, she’ll likely die, and if he doesn’t save the president, the terrorists will be able to launch nuclear weapons and start a world war. His internal motivation is that he desperately needs his daughter to be proud of him and to prove to her that she can count on him. Another way to look at this is that the external motivation is our plot and the internal motivation is our character arc. That internal need is the true driving force of the plot, and what our character experiences on the outside forces them along their internal arc and forces them to grow. We are all driven by our internal needs, whether we’re aware of them or not. Here’s why understanding the difference between external motivation and internal, subconscious motivation (the need) is so cool. Your character might fail at their original external goal, but as long as that failure still meets their internal need or motivation, you’re going to have created a satisfying story. Do you have any other tips about character motivation that you’d like to share? The foundation of every functional novel is goal, motivation, and conflict. What your character wants, why they want it, and what they’re willing to endure to get it. Sounds simple in principle, right? But I’ve seen a lot of people struggle with this, so over the next few weeks, I’m going to walk you through each point. If one of these core concepts isn’t working, your whole story falls apart. Your character’s goal is their external, conscious desire. It’s the thing they want to achieve over the course of the story. When I say the goal is important, I mean that there will be big, negative consequences if your character fails to achieve that goal. In order to reach their goal, your character should have to suffer and struggle, so if the goal isn’t important, your character isn’t going to be willing to keep pursuing it. I’ll talk about this element a bit more when we get to motivation, but I want to say one more thing about this here—the goal needs to be important to your protagonist, not necessarily to the world. A story about a woman whose goal is to adopt a child can be as powerful and captivating as a story about a woman whose goal is to locate a terrorist cell and stop them from bombing the U.S.
It’s the character who drives the story and so the goal needs to be personal and relevant to that character, regardless of how the rest of the world feels about it. And if the goal is big like “save the world,” you’ll still need to find a way to make it personal for your protagonist (for example, by showing a person they love who will die if the big, bad thing happens). This is why so many “save the world” movies and books show you the protagonist’s child or wife or husband or brother first. It always starts by being personal, then it becomes business too. An urgent goal is one your character has to act on right now. If they can wait a few months or a year before pursuing their goal, then it’s not an urgent goal. Another way of saying this is that the goal needs to be time sensitive. Humans don’t tend to like change. Unless there’s a reason we need to act on something immediately, we’ll often put it off because we’re comfortable the way we are, even if the way we are is actually hurting us. We’re afraid that if we try to change, either we’ll fail and make it worse or the change we attempt will make our life worse than it was before. We don’t trust change. Concrete is the one that trips a lot of people up because it’s easy to confuse an ambition with a goal. An ambition can’t carry a story because we don’t know what to watch for and we don’t know when we’ve reached it. Goal: Workout five times a week. How do you know when you’ve achieved the ambition? What does it look like? It’s too nebulous and the end point isn’t clear. This is why so many people fail in their New Year’s Resolutions. They set ambitions rather than goals. You know exactly when you’ve achieved the goal. It’s measurable. It’s external. It’s visible. Right now someone is sure to object that their character’s goal is internal. Even if our character’s goal is internal change, we still need to create a concrete, external signpost of what this looks like to them to achieve it. Here’s an example. Let’s say at the start of the book, our character struggles with an anxiety disorder and it’s ruining her life. She doesn’t like to leave her house, and her relationships are falling apart. Ambition: Overcome my anxiety disorder. Internal Goal: Learn to manage my attacks when they happen so that they don’t spiral out of control and prevent me from doing the things I want to do. External Sign: Be able to volunteer at the hospital like I’ve always wanted but couldn’t because the blood, wounds, and fear of catching something have always triggered my anxiety. Internal goals are absolutely fantastic when coupled with an external sign this way because then you’ve got plot and character arc working together. Extra Tip: One area where a lot of writers get confused is that there’s a big-picture story goal, but each scene also has a goal. Our character is going to have smaller-scale goals along the way, and those goals will be steps to achieving their big-picture goal. Have you struggled with creating a goal that meets these criteria? Or have you seen now that your book’s current goal isn’t a workable goal at all? Feel free to share in the comments!